You are warmly invited to join us for the screening of a selection of short films made in response to the recent deluge of COBRA committee meetings, about the winter flooding affecting large parts of the United Kingdom. 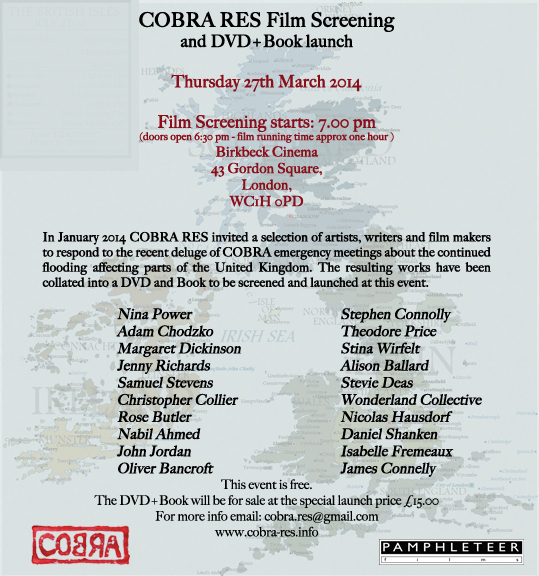 This will also be the launch of ‘COBRA 1.3 DVD + Book’ that contains all the films and newly written text based responses. COBRA : A Critical Response 1.1 Book is now available to buy at the ICA London Bookshop or online below.